Just made a black maxi dress--can it work for fall? 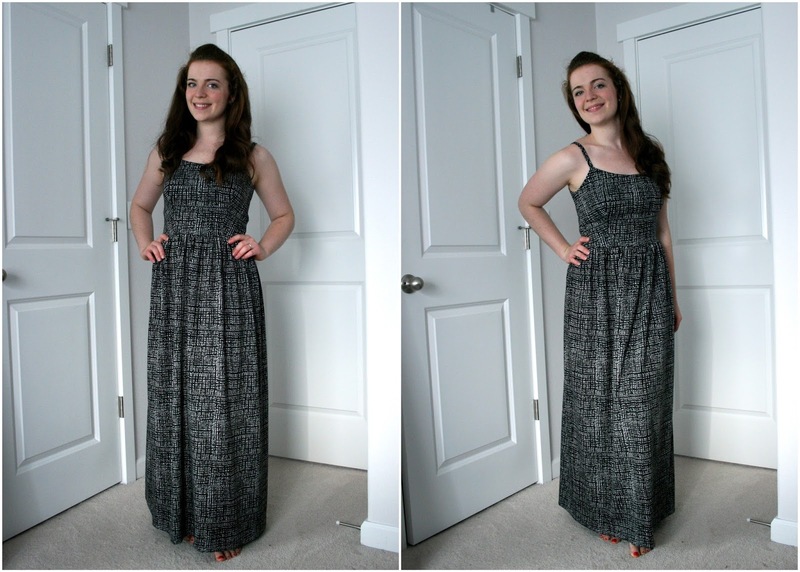 I made several maxi dresses this summer. They rock. I love them. But they feel so summery to me, and in bright and preppy colors, I'm just not sure I can wear them now that summer is winding down. But I know it can be done with some maxi dresses and skirts, right? I was hoping so when I finally started sewing this new maxi dress. I got the fabric from my mom a couple months ago now, and cut it out last month, but hadn't sewn it yet! This is one of those excellent free fabric dresses--my mom got this awesome black/ivory patterned knit for free from her supplier as a sample or bonus or something. They do that when you make huge bulk orders all the time, I guess! But it will never work for her historic clothing sewing purposes, and she gave it to me at a time when I was seriously bored with my fabric stash. Which I still am. A little uninspired, really. So I used almost all of the fabric and made it into this! But now it's got me thinking--how can I wear this dress after Labor Day?? I feel like I've read in magazines, "how to wear a maxi dress for fall," but I don't remember exactly what they said. So I thought about it and dug around my Pinterest, and came up with these tips for myself! Try wearing your hair down instead of in the top bun you've (I've) been wearing on hot evenings with my dresses! Get creative and try layering a long-sleeved tee underneath! I'm sure you have some more ideas. Would you pull off a maxi dress after summer's over? How would you wear this one?! I think a nice cardigan (maybe a mustard yellow) plus a cognac coloured belt on top, knotted around the waist would be really pretty. I'd totally throw a light sweater over it, maybe one with a wider neck so it falls off a shoulder. Love the fabric choice on this. Looks great. This is a gorgeous dress - and it has so much potenital. It really is the perfect 'build block' to work for autumn (I'm from the uk!). And I love the fabric you used, so much more interesting than plain black, but still works as a basic. Very cute! I think I actually have some of this fabric (a heavier knit ponte? I got mine from Fabric Mart) and I think your dress looks so lovely. 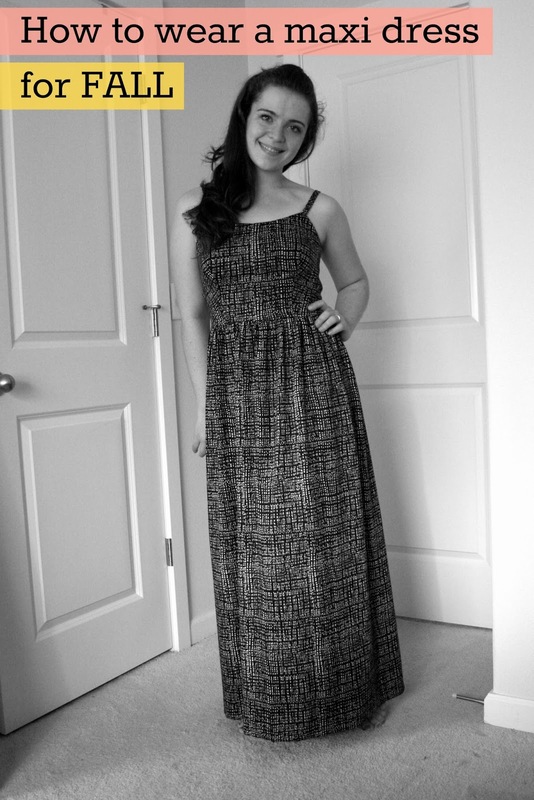 And because the fabric is heavier, it works so great for a fall maxi dress. With a cute short jacket or cardigan it would be perfect! Or you can always make one just for fall. Something like Simplicity 1623 if it is small enough for you, or alter one of your others. Or a really cute cover up to match the ones you have. I love all of the cover up styles the past few years and they would be fun with a maxi. Now I'm off to check my closet. Love this! I like that you put straps on it to make it work appropriate. I bought an Autumn maxi dress, at the thrift store, the other day. It requires some work but I've debating on how to style it. This really helped! I love it. It looks great on you. Thanks for the inspiration! Maxi dresses totally work for fall! Have fun styling this one up!! Love this dress, great fabric choice, you can wear it in any season! You could also layer a thin long sleeve black top underneath it and it would look like a long sleeved dress. I've worn them with a jean jacket and cardigans. I like the idea of a top underneath--hadn't thought of that one! !